This pack contains 17 cards, balanced to let you use them as a quick rigged demo for your friends, to get them into the madness that is Munchkin! This is an expansion for Munchkin. It is not a stand-alone game. This is NOT a collectible or randomized set. 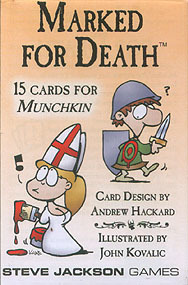 Every Munchkin Marked for Death pack is the same as every other.